Ein Engel wird kommen. Er hat eine Botschaft für uns. Es ist eine Botschaft der Liebe und des Lichts. DEVA- Texte der Botschaft in Deutsch, Englisch und Spanisch. DER ENGEL: Kinder des Lichts hört mich an! DIE MENSCHEN: DEVA! Sie kamen von überall her, den Engel des Lichts zu sehen und sie warteten bis in die Nacht auf ein Zeichen von ihm, und dann erschien er in all seinem Glanz. DIE MENSCHEN: OOH! DER ENGEL: Kinder des Lichts hört mich an! DIE MENSCHEN: DEVA! DER ENGEL (während die Menschen immer wieder DEVA rufen) : Kinder der Liebe, der Treue, der Freude, der Freiheit, Kinder der Hoffnung auf eine neue Welt des Friedens und der Liebe. Könnt ihr es fühlen? DIE MENSCHEN: JA! DER ENGEL: Könnt ihr es fühlen? DIE MENSCHEN: JA! DER ENGEL: Könnt ihr es fühlen?? DIE MENSCHEN jubeln: JAAAA! DER ENGEL: Ich komm von einem andern Stern. Ich bin der Engel des Lichts. Und ich bring eine Botschaft von Liebe und Frieden zur ganzen Welt. Weil am Ende doch nur die Liebe zählt. DER ENGEL spricht: Dies ist meine Botschaft. Liebet einander. Vergebt allen und euch wird vergeben werden. Was auch immer geschehen ist, es hatte einen Sinn. Völker der Erde, schließt Frieden miteinander. Missbraucht diese Erde nicht. Sie ist ein lebendiges Wesen. Was habt ihr mit ihr getan? Ihre Flüsse weinen, ihre Berge zittern und ihre Wälder sterben. Habt doch Mitleid. Treibt es nicht zu weit. Kehrt um, bevor es zu spät ist. Ich muss euch nun verlassen... DIE MENSCHEN: &xnbsp;OHHH! NEIN! &xnbsp;DER ENGEL: &xnbsp;Ich komme wieder. Ich liebe euch alle. Ihr seid meine Kinder, die Kinder des Lichts. &xnbsp;Sagt es mit mir: LIEBE!&xnbsp;DIE MENSCHEN: LIEBE! &xnbsp;DER ENGEL: FREIHEIT! DIE MENSCHEN: FREIHEIT! &xnbsp;DER ENGEL: FRIEDEN! &xnbsp;DIE MENSCHEN: FRIEDEN!&xnbsp;LIEBE! FREIHEIT! FRIEDEN! DER ENGEL: &xnbsp;LOVE! LOVE! LOVE! LOVE! LOVE! LOVE Nur die Liebe allein, nur die Liebe allein, sie kann uns befreien! DIE MENSCHEN: LIEBE! FREIHEIT! FRIEDEN! DEVA! (4:55) . Extended version with additional lyrics (22:50). Music and lyrics: Christian Anders. Published by: Anders/Troja/Gede. Co-producer: Jacquie Sullivan. THE ANGEL: Children of light listen to me! PEOPLE: DEVA! Christian Anders: They are coming from everywhere, to see the angel of light. And they are holding each others hands and they wait until the night. And then they hear a sound, and they see a light. PEOPLE: OOOH! THE ANGEL: Children of light listen to me! PEOPLE: DEVA! THE ANGEL (while people always respond: DEVA!) Children of love,joy, truth, freedom, children of hope! For a new world of love and peace. Can you feel it? PEOPLE: YEAH! THE ANGEL: Can you feel it? PEOPLE: YEAAH! THE ANGEL: CAN YOU FEEL IT?? PEOPLE (applauding): YEEEAAAH!! THE ANGEL: I´m coming from a distant chain. I am your angel of light. And I bring a message of love and of peace to all mankind. And I want you to know, that you are not alone. THE ANGEL : This is my message: Love each other! Forgive and you shall be forgiven! Whatever happened had a purpose. Forget the past. Nations of the world, make peace. Don´t abuse your planet earth. It is a living being. What have you done to it? Its rivers are crying, its mountains are shaking, and its forests are dying! Have mercy! Don´t go too far! Turn around before it is too late! I will leave you now. PEOPLE (disappointed): OOHH NO! THE ANGEL: I will come back. I love you all. You are my children. The children of light. Say it with me: PEACE! PEOPLE: PEACE! THE ANGEL: LOVE! PEOPLE: LOVE! THE ANGEL: FREEDOM! PEOPLE: FREEDOM! PEOPLE: Peace, love, freedom! THE ANGEL: LOVE! LOVE AND PEACE! PEOPLE: DEVA! THE ANGEL: Love and peace shall set you free. PEOPLE: PEACE! LOVE! FREEDOM! DEVA! LA GENTE: DEVA! EL ANGEL: Hijos de la luz escuchen me! Christian: Vienen de todas partes, a ver el angel de la luz. Y se toman de las manos y sesperan hasta la noche! Y escuchan un ruido, y ven una luz. EL ANGEL : Hijos de la luz escuchen me! LA GENTE: DEVA! EL ANGEL: Hijos de amor, felicidad, verdad, libertad, hijos de esperanza, para un nuevo mundo de amor y de paz. Podeis sentirlo? LA GENTE: YEAH! EL ANGEL: PODEIS SENTIRLO? LA GENTE: YEAHH! EL ANGEL: PODEIS SENTIRLO?? LA GENTE (frenetico): YEEAAHH!! EL ANGEL: Vengo de otro mundo. Yo soy el angel de la luz. Yo os mando un mensaje de amor y de paz para todo la humanidad. Yo creo en amor, amor y paz. EL ANGEL: Soys innocentes, soys simple, soys como ninos. Perdona y tu seras perdonado. Lo que paso tenia su razon. Olvida el pasado. Las nationes del mundo, esperan hacer la paz! No abuses del planeta tierra! Es un ser vivo! Que avez hecho? Los rios estan llorando, y las montanas estan temblando! Tien piedad! Reves que sea demasiado tarde. Yo os dejo ahora..." LA GENTE: OH NOO! EL ANGEL: Yo regresare. Yo os amo todos. Vosotros soys mis hijos, hijos de la luz! Decis conmigo: Paz! LA GENTE: PAZ EL ANGEL: AMOR LA GENTE: AMOR EL ANGEL: LIBERTAD LA GENTE: LIBERTAD LA GENTE: PAZ! AMOR! LIBERTAD! EL ANGEL: AMOR! AMOR! AMOR! AMOR! LA GENTE: DEVA! EL ANGEL: AMOR Y PAZ! HIJOS DE LA LUZ ESCUCHEN ME! LA GENTE: DEVA! ANGEL: Color of red answer me! Speaker: „Thanks Linda. Well people…“ (voice fades). 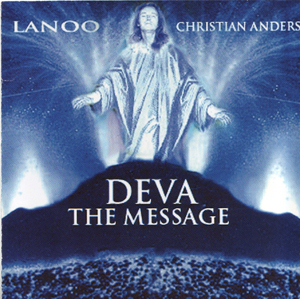 Lanoo sings: „They are coming from everywhere, to see the angel of light! And they dream and they hope and they pray that he soon will arrive. Waiting with tears in their eyes, and love in their hearts. They wonder how it would be, to see an angel of light. And they are holding each others hands, and they wait until the night. And then they hear a sound, and they see a light. ANGEL: „CAN YOU FEEL IT?! The Mantra: OM MANI PADME HUM! The ANGEL speaks: „This is my message: Be pure, be simple, be innocent. Love is everywhere, in the running rivers, in the trees, in the whispering wind, in the cry of a newborn baby. In all these things and more is love. But it is not dependent on them. Love is a state of mind. Do not worship anything that has shape or form. The ever Invisible, ever Unknown … (you can not find it, because you ARE it in essence. It is NIRVANA. Lanoo) , …is where you came from. Live up tot he source, which ist he Spirit. Material world is just an illusion. Let go. Do not worry. Do not expect anything from the world, and you will have … everything, Everything you need. Be like a child again. Spirit (when seen as NIRVANA. Lanoo) is immortal, the Spirit (NIRVANA. Lanoo) is your cradle. The physical body is mortal. Choose to be immortal. Dont be afraid. Death is not existing. There is just unbroken consciousness. You wake up on a higher level. Feel the power of the uncreated Spirit in you. Wait for the inner voice to show you the way. THEN you will do what you are meant to do, not what you „want“ to do. Spirit (NIRVANA. Lanoo) is reality. Matter is illusion. Matter DEVOID of Spirit is evil. Close your eyes… AND SEE. Open your heart and LISTEN, listen in the silence to the voic e of your higher Self. YOU are God. There is no other god than the god IN YOU. What are you searching for? There is nothing to achieve. Everything is right there. IN YOU! Don´t be afraid. One day all suffering will have an end. You came from the light, you go to the light. SPIRIT (NIRVANA. Lanoo) you are, SPIRIT you were, and SPIRIT you will be. Nations of the world, destroy your weapons! Make peace. The day of destruction is near. Not because you have failed, but because the cycle is closing. Nevertheless: All holy will be saved. All unholy destroyed. Matter must perish, so that Spirit can live. The expander becomes the pervader, who turns into the destroyer (SHIVA. Lanoo). AUM to the Causeless Cause. Make only love tot he one you truly love. Do not misuse your sexual energy. Sexual energy ist he most precious gift. In my world we call it FOHAT. The planets and universes are built through it. To you it is: KUNDALINI! Misuse Kundalini, and you become an animal. Again I say: Be pure, be simple, be innocent! Once you were the light carriers. When there was only one knowledge, one language (Sanksrit. Lanoo) and one truth. But then you fell. This is, why now you have many „truths“, many languages, and many religions. But the truth will come back to you. And now listen to the words oft he Central Sun, vibrating THROUGH ME! ANGEL: „What a JOY! How I FEEL your love. Let me give you all I have. The power of the universe is at your feet. USE IT, to heal this planet again. It is a living being. What have you done to it??! IT IS SUFFERING! Its rivers are crying! Its mountains are shaking! It has not enough air to breath!